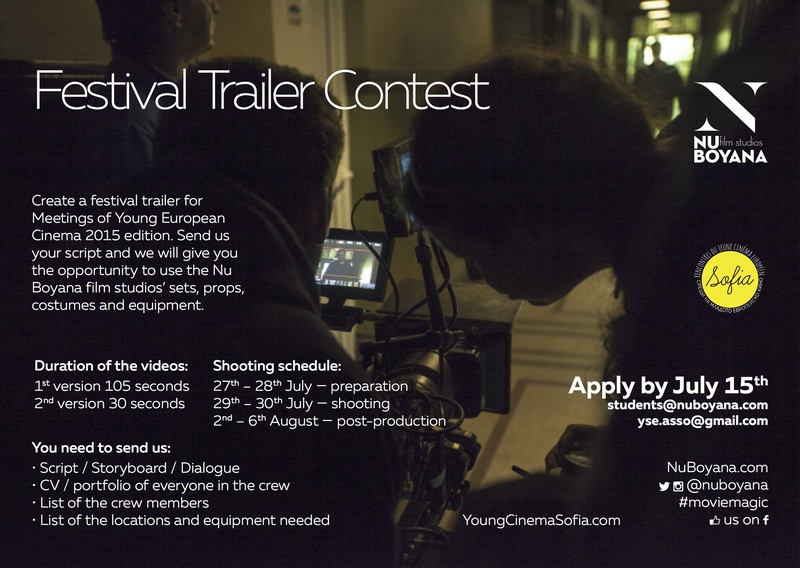 Nu Boyana Film Studios and Meetings Of Young European Cinema festival are honored to announce a competition for a creation of a promo trailer for this year’s edition of the festival in Sofia. Get an opportunity to use Nu Boyana sets, the best professional equipment and widest variety of props to tell your story! Crave your video to be seen by many on a big screen? Wonder how is it like to work in the biggest film studio in Eastern Europe? Gather a crew and TAKE YOUR CHANCE! Use your own script or our idea for the video (see below). 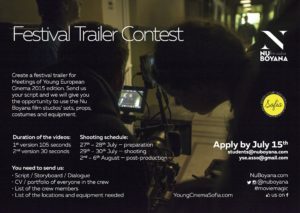 Apply at yse.asso@gmail.com and students@nuboyana.com. (Links to your work on platforms like YouTube, Vimeo will help us to make the decision. Videos can be password protected). Each team will present two versions of their videos: 30 and 105 seconds long. The winning promo will be aired on the screens in Sofia metro and ground public transport. The trailer will be also shown during the festival before every screening. The script should represent the youthful, unorthodox, and international spirit of the festival. We see it as a full of humor piece on love for film and filmmaking. We suggest the following script for your video, however encourage you to present your own story. Two people having a conversation. One of them is retelling films as children do – disorderedly, passionately. The other is listening. We see them walking through different places and times (most probably in their imagination). One of them is characterised by some costume idiosyncrasy (carrying a cosmonaut helmet, for instance). When one is telling a scene, the other is trying to imagine it and we see shots from films (of the selection). The two end up in the middle of a set where film is being shot. They are urged to move away. For more #MovieMagic follow us on FB, Twitter, Instagram!